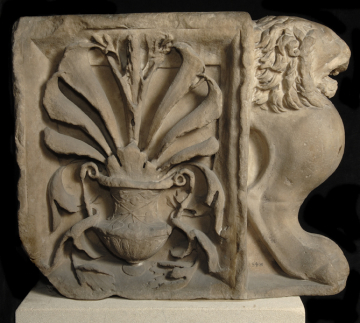 A rectangular support with a lion's head, stylised leg and paw on a base at the outer end. In inset relief on both sides is a vine-decorated krater from which grow acanthus leaves. Bench supports such as this are found in considerable numbers throughout the museums of Europe where they are often used as supports for the sarcophagi on display. There are excellent comparative series of these bench supports in Room V of the Lateran Museum, Rome (nos. 306, 310, 313-316). 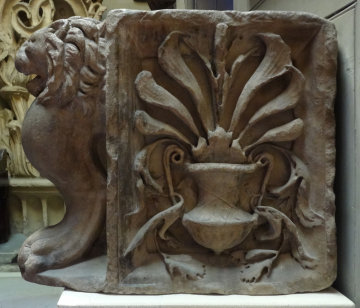 There is also a series with lions' feet at both ends in the Antiquario of the Roman Forum. If the former, the Soane type, they were backed benches or set against walls, as in theatres or the Colisseum. The Museo Forense type were probably freestanding seat supports as were the four examples (halved?) let into the bases of statues in the Villa Borghese (nos. CCXXVI, CCXXVIII, CCXXXX and CCXXXXII). Rome; collected in Rome by Charles Heathcote Tatham for the architect Henry Holland during the 1790s. See Cornelius Vermeule, unpublished catalogue of the Antiquities at Sir John Soane's Museum, Introduction, transcription of Tatham letters, List 3, no. 33. Tatham: Etchings, 1; Drawings, 8.